I’m going down the gingerbread path again; just can’t help myself. We were making a gingerbread house with buttercream frosting for the glue. Trying to build the house proved difficult because everyone kept dipping the walls and shingling into the frosting and then their mouths. The buttery goodness just works so well with the crunchy, gingery, spicy flavor. I thought about turning the cookies into a pancake, but it just wouldn’t be complete without the frosting. So why not combine a little frosting into the syrup? 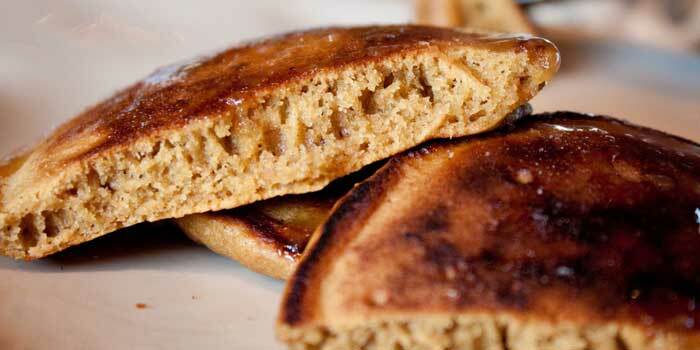 Yummy, hearty pancakes with a spiced molasses edge topped with a buttery maple syrup. Oh hell yes. It is worth the extra work out. These pancakes were the hit of the breakfast holiday work party. I mixed the batter before heading in, brought along an electric griddle, a pre-cooked strata and all the fixings. We played “guess the stache,” a fun card game that has an image of famous mustaches on the front and hints on the back. Not sure if it was the pancakes, the game or the champagne, but it sure was a super fun gathering. You could make these Fat and Happy Gingerbread Pancakes any time of the year for any party, but they feel right during the cold winter months. Whisk together all the the dry ingredients, including 1/2 of the brown sugar. In a smaller bowl, whisk together the eggs, molasses, water and the remaining brown sugar. Using a fork, stir together the wet ingredients into the dry, and mix only enough until everything is wet. Let the pancake mixture rest for 20 minutes. Stir in the melted butter just before cooking. Heat a griddle on medium high heat (about 350 degrees). 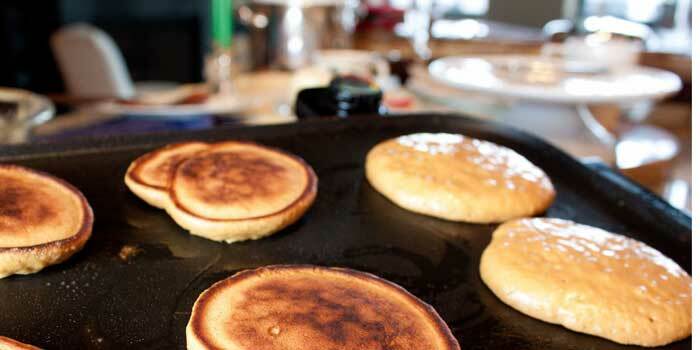 Lightly butter the griddle, pour a scoop of batter onto the hot griddle. Cook until the bottom of the pancake is golden brown (the top will have popped bubbles). Turn and cook until golden on the other side. 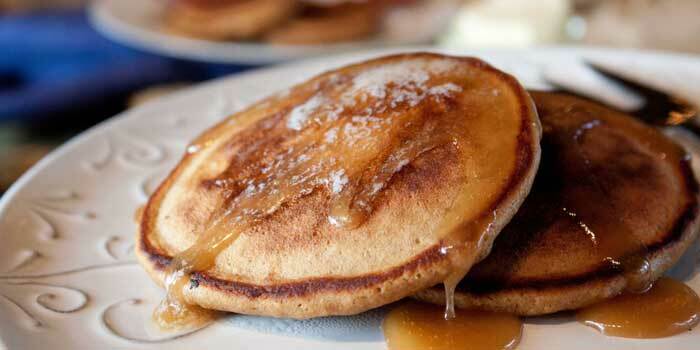 Serve with the warm buttercream syrup. In a small pan, melt the butter over low heat. Whisk in the powder sugar, followed by the maple syrup, cinnamon and vanilla. you will need to whisk well to ensure there are no lumps. You can also use an immersion blender for ease. Keep warm until ready to use. Fat and Happy Food Blog: Premix the batter up to a few hours prior to using, but hold out the melted butter, adding only just before you begin to cook them.